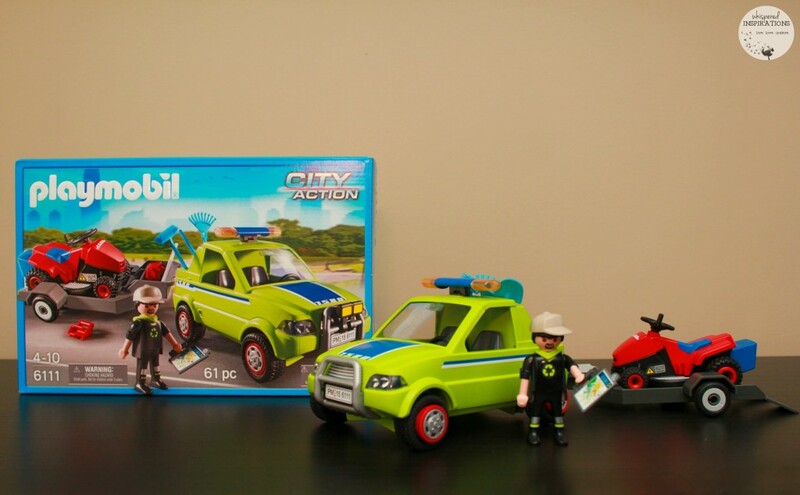 You are here: Home / Product Reviews / Babies & Kids / PLAYMOBIL NEW City Action Cleaning Themed Toys! Our girls absolutely love to play with PLAYMOBIL sets, it keeps their imaginations soaring. With Spring in the air, I am thinking about Spring cleaning. My girls on the other hand were excited to discover that PLAYMOBIL has new action sets that promote Reduce, Reuse and Recycle and inspires our youth to take care of our planet. We have always tried to minimize our carbon footprint and have taught the girls to make better decisions. They began assembling all the sets as soon as they got them. The City Action Recycling Truck, City Action Landscaper with Lawn Mower and the City Action Street Cleaner. This set is a whole lotta fun! 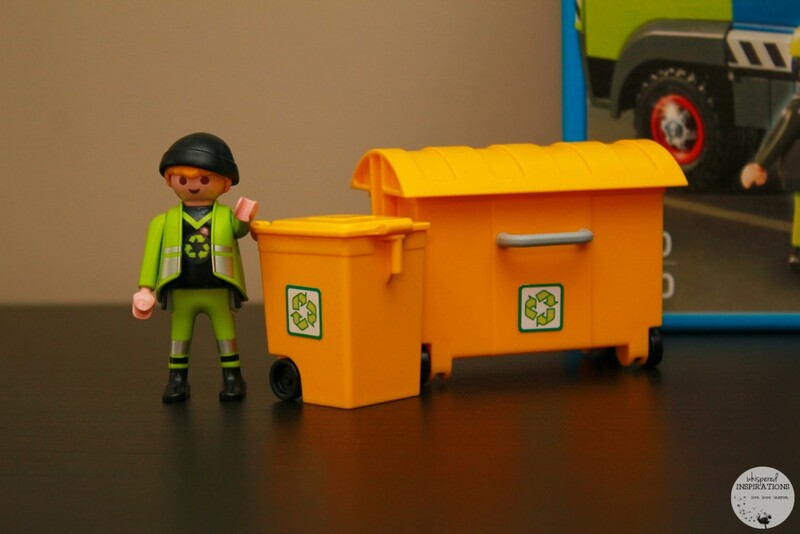 It includes two figures, truck, large and small recycling bins, fire extinguisher and walkie-talkie. Everything you will need to operate a truck and to set out to clean out your very own city! Today is recycling collection day! 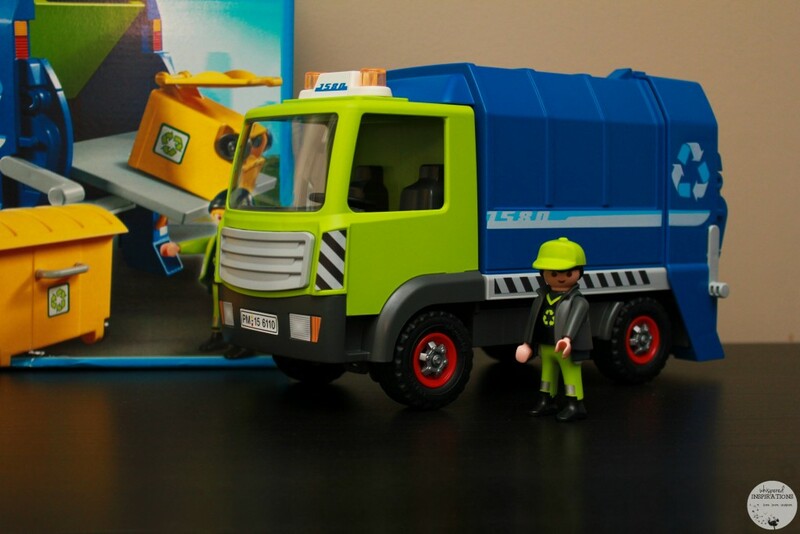 Reduce, reuse and recycle with the ultimate PLAYMOBIL Recycling Truck. Take a seat in the driver’s cab and prepare to make your rounds. Attach the recycling bins to the back of the truck, and use the back-side lever to tilt the door of the back container and empty the bins into the container. When it’s time to empty the truck’s contents, tilt the back container. What I loved about this set is that they are durable. Mimi took them outside and had a ball playing in the city that exists in her imagination. The toys are durable and very easy to assemble. She had a little bit of a tough time attaching the wheels but, with a little help she was on her way. She particularly liked the recycling bins where she could pick up waste (paper) and put them in the containers. This set is perfect for ages 4-8 and you can get this set for $46.99. The second set is the Landscaper with Lawn Mower. Gabby absolutely loved this one because it attached to a cool and fluorescent green car. Gabby easily assembled it and was outside pretending to mount the mower and head out to a “client’s” house to mow their lawn. 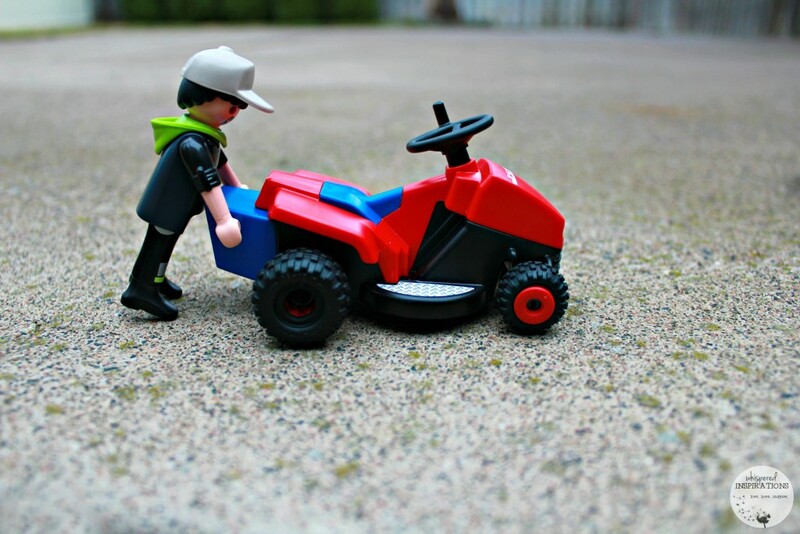 Whether it’s pruning the hedges or cutting the grass, the PLAYMOBIL Landscaper with Lawn Mower can get the job done! His car with trailer hitch connects to the trailer, which he uses to transport his landscaping equipment. The set includes one figure, car with trailer, lawn mower, rake, shovel, broom, and lots of other accessories. The girls combined both sets to make an ultimate City Action cleaning spree! This set is great for ages 4-8 and you can get it for $32.99. This one was fun, we all know the streets can get messy and dusty. The girls got a kick out of this one because they have seen the truck in person and they loved that they could “sweep” with their truck. 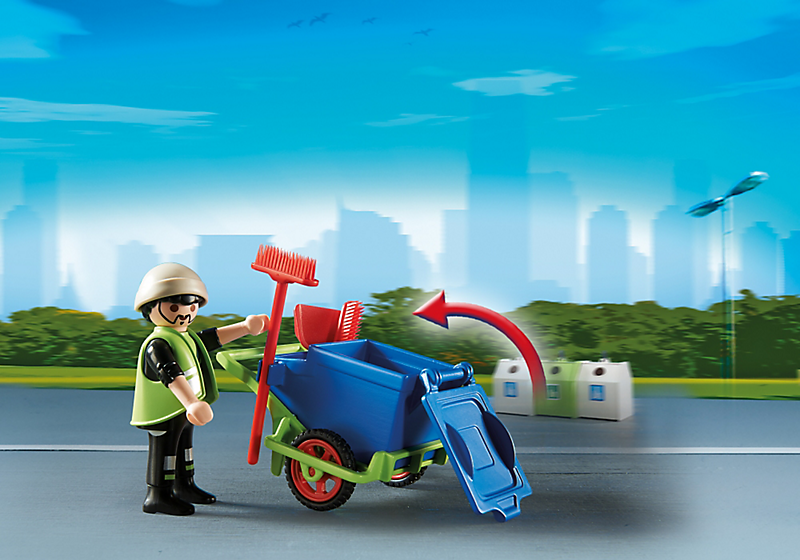 Keep the city streets in tip-top shape with the PLAYMOBIL Street Cleaner. 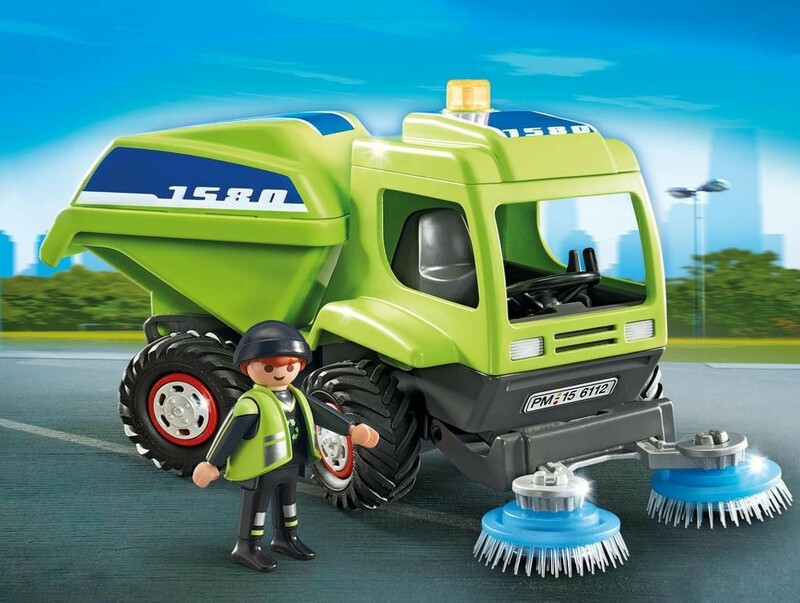 The vehicle’s rotating brushes scrub down the pavements and ensure the city stays clean. The cab can seat one figure, while the tilting rear container can be emptied through the back door. 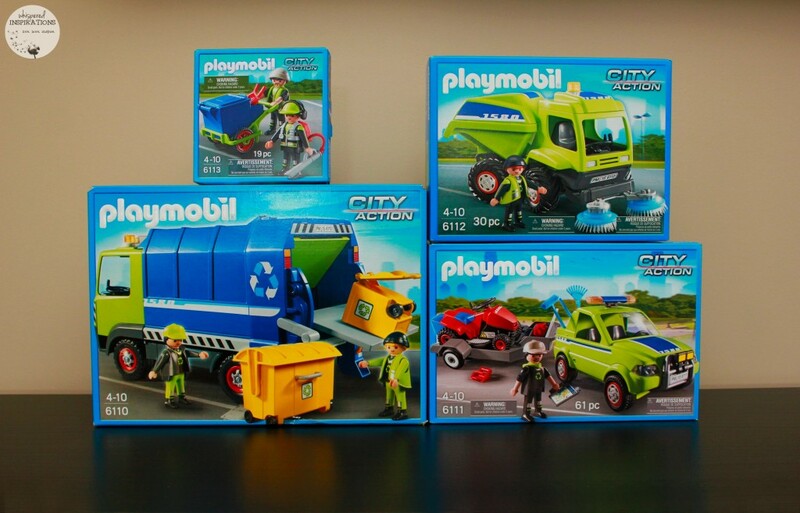 The set includes a sweeper truck and a figure and is for ages 4-8, you can purchase it for $25.99. These guys mean business and they have all the tools too. That’s one of the things that I loved about all of the sets, the attention to detail. They have all the tools, functioning parts and even stickers that most containers have. The sanitation team comes with two figures, garbage container, leaf blower, brooms and other accessories. 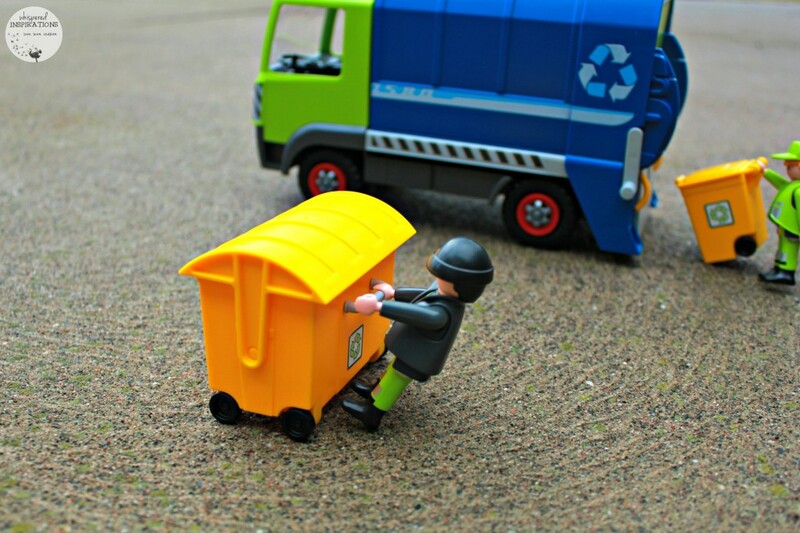 When it comes to the details, the PLAYMOBIL Sanitation Team is on the scene. With their garbage container, leaf blower, brooms and other cleaning equipment, they gather waste and clean the streets where the Street Cleaner machines cannot! This one rounds out the whole set, don’t you think? The set is perfect for ages 4-8 and you can pick it up for $10.99. 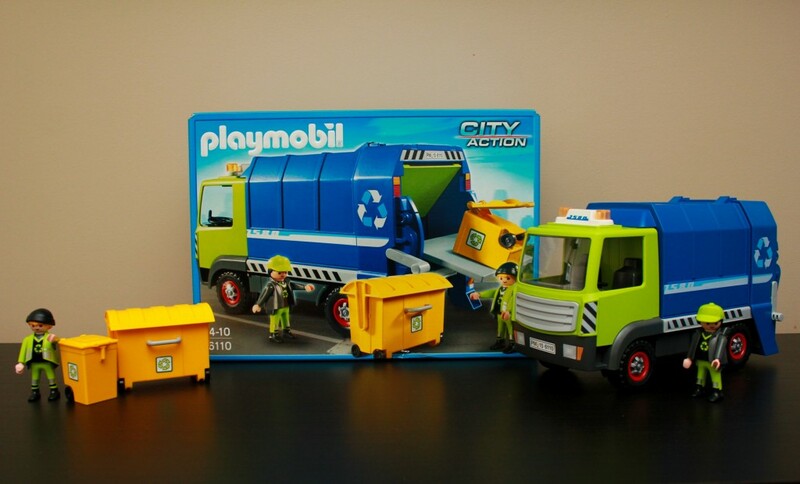 One lucky Whispered Inspirations reader will a PLAYMOBIL City Action Recycling Truck! This contest opens on April 5th, 2016 and closes on April 20th, 2016. Open to Canada only! Make sure to visit www.playmobil.ca for more information and to see the entire set. You can always follow them on Facebook, Twitter and Instagram too. 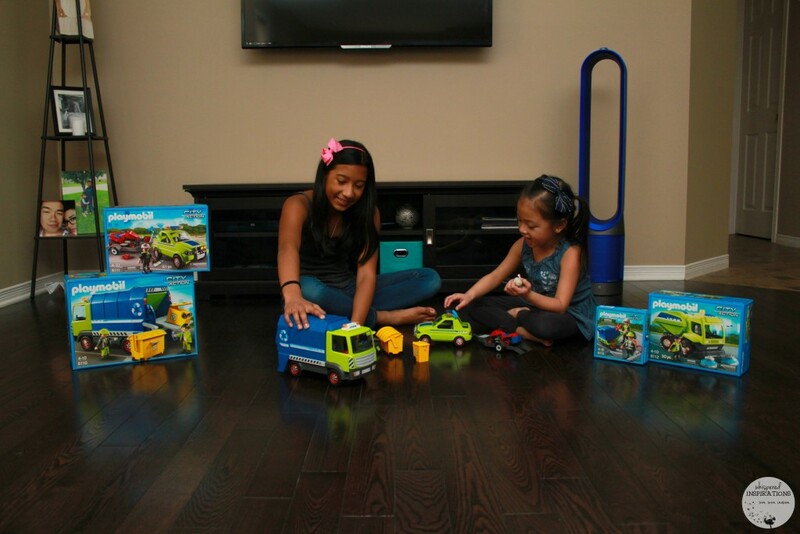 Do your kids love toys that teach them about being green? The Street Cleaner would be a great one to have! I am sure my nephew would also like the Landscaper with Lawn Mower. The Landscaper with Lawn Mower looks like fun! My kids would like the Street Cleaner. The Street Cleaner is adorable! My son would love the street cleaner. 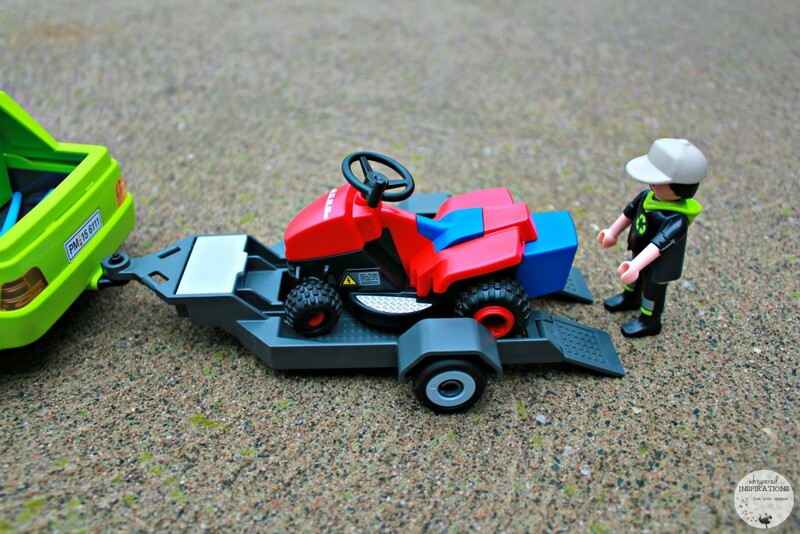 The Playmobil Landscaper with Lawn Mower is really cool! landscaper/lawn mower is another great one! Landscaper with Lawn Mower is so cute. Our little guy would also love the Landscaper with Lawn Mower. I would love the City Action Plane. My grandson is very into planes right now. My daughter would love the Glass Sorting Truck. She loves anything with a crane! My son would love the landscaper with lawnmower. We try to take care of the planet by recycling everything we can. that city street cleaner would be a popular choice in this house! We'd also love the glass sorting truck! We recycle, walk instead of drive, buy used clothes, and hang our laundry! My son would love Future planet sets. I think my son would love the Street Sweeper! He always loves watching them go by our house! My little guy would love the Landscaper with Lawn Mower set. Love Playmobil! The Sanitation team is kinda cute! I think the street cleaner would also be a hit. Love Playmobil toys! The Modern Masion is very cute and playful. I would also love the City Action Rescue Boat. The sanitation team would also be a nice one to get. It is a great set! The recycling truck would be a fave…. My son would love the school bus with the flashing lights. We try to protect the environment by picking up garbage that is laying around when we see it. My son would love a Street cleaner. We take care of the planet by conserving energy, composting and recycling. We are planting bee friendly flowers this summer to help the planet. In our family we take recycling very seriously, we recycle, reuse, sell, trade or giveaway as much as we possibly can. Turning old things into new things through crafting or just finding a buyer for odd items that other people might just throw out is one of our favorite pastimes. It helps the environment and our wallets too! We take care of the planet by eating organic foods, using only LED lights, and recycling! My granddaughter would love to get the Pegasus with Princess Vanity Station. I would like the Glass Sorting Truck from the series too. My child would really like the street cleaner! The city street cleaner would be another hit for my nephew! Another toy from the collection would be the Glass Sorting Truck, my grandson would love any of them! My son would love the Glass Sorting Truck. He LOVES anything to do with garbage and recycling trucks. The Ice Cream Man would be alot of fun! The Glass Sorting Truck would also be a hit! My son would love the Fire Station! My grandson would LOVE the rescue ambulance. My son would like the landscaper with the mower. My kids would like the glass sorting truck. The Landscaper set with the Lawn Mower would be a hit too (but then I think the entire series would be). We recycle to help do our part for the planet. We would like the Street cleaner..
We use reusable water bottles to help the planet. My nephew would love a recycling truck. My family especially the girls are trained to recycle. They know how to sort our garbage. We also compost our biodegradable waste as our little act for Mother Earth. The Glass Sorting truck would be a big hit I think with my nephew. We recycle everything we can, donate items we no longer need/use & try to repurpose items to help the planet. The Street cleaner would also be fun to have. We try to help care for the Planet by recycling,reusing and not wasting water. We use water saving shower heads and toilets to help the planet.